Spam Bully is a Bayesian spam filter that intelligently keeps your Inbox free of spam. Easily integrates into Outlook. Easy to use toolbar. Allow or block email addresses, IP's, words/phrases you choose. Block spam by country and language. Bounce spam back to spammers. Report spammers to their hosts and the FTC. Forward only good emails to your cellphone. Send challenge emails to unfamiliar emailers. Auto delete spam from spammers on your Block list before it downloads to Outlook. Comprehensive statistics. Convert the SpamBully toolbar into English, Spanish, French, Italian, German, Russian, and other popular languages. Every feature is fully customizable. 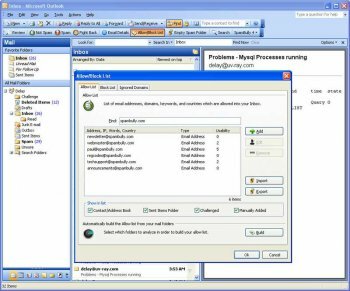 Outlook 2003's built-in spam filtering does a very efficient and dependable job on filtering spam, especially if you install the filter updates via Microsoft Update each month. It's also free and customizable. This shareware on the other hand, costs $25 after the trial is about as reliable as Outlooks, and doesn't seem to have the options that Outlooks' native filter has. Hmmm Outlook 2003 spam filter or a real spam filter... Gee Think I'll go with a real spam filter... Outlook's is very basic an incapable of filtering out most spam now bombarding my mailbox. Outlook has its own built in spam detection now, and it's really quite effective. It has white lists, black lists, levels of detection etc.... this software is on its way to total "waste" so getting it is pointless, and paying for it, is stupid. 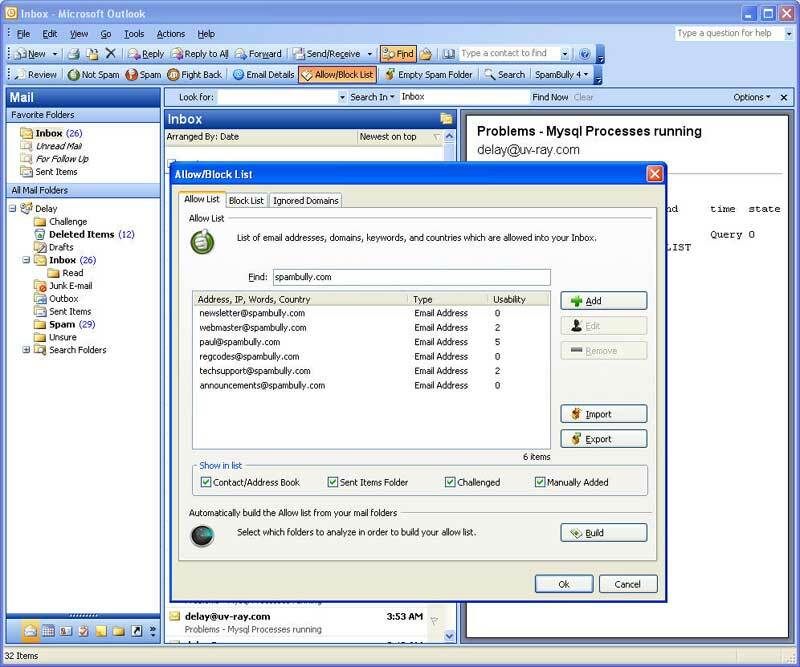 Especially since the screen capture shows outlook 2003, and Microsoft releases detection updates periodically. well, at the time i reviewed it, it was free. it wasn't until recently that they decided to make it shareware not freeware. SpamNet by Cloudmark is NOT free anymore. Free is good. $$ is not. After I installed Spam Bully and chose "Check inbox", it downloaded my messages and automatically marked email as spam (wrongly!!) and sent out "please confirm you're not a spammer by typing the password" to some business contacts! This is quite painful. messages automatically or at least have a confirm question! I'd like a standalone version much more than an Outlook plugin, because it would be able to act as a "simple" pop3 checker. The program does look very promising (compared to SpamKiller and Mailwasher), but I think there are still quite some quirks to get rid of. Easier adding of email addresses to white and black lists would be nice too.